During this political season, we have heard a lot about too-big-to-fail banks, corporate greed, politicians on the take, bad trade deals, inequality and … starting a revolution to save the middle class. Just over 100 years ago, at the dawn of the first American Progressive Era, the same conditions sparked a revolution which spread from North Dakota throughout the prairie states. In the early 1900s, family farms were under attack. Railroad robber barons charged farmers exorbitant prices to ship their grain, and if the farmers fell behind on loan payments, Wall Street banks stepped in—not to save the farmers but to foreclose on them. As one farm family after another lost its land, politicians, who were in the pocket of big money interests, accepted the lobbyists’ cash and stood idly by. Discontent grew among the farmers. In 1915, failed flax farmer A.C. Townley and his friend Fred Wood sat down at Fred’s kitchen table and drew up a progressive agenda to help the people of North Dakota. This blueprint for reform included regulating railroads and controlling fees, organizing farming cooperatives, and creating a state bank, which would make investments for the common good, instead of foreclosing on family farms. This was the birth of the Nonpartisan League (NPL). Townley attached a Nonpartisan League sign to his Model T and began traveling around North Dakota to recruit citizens to join the Nonpartisan League and fight for change. Charging $6 for dues, Townley organized farmers, intellectuals, writers and women to stand up against the banks and the railroads. 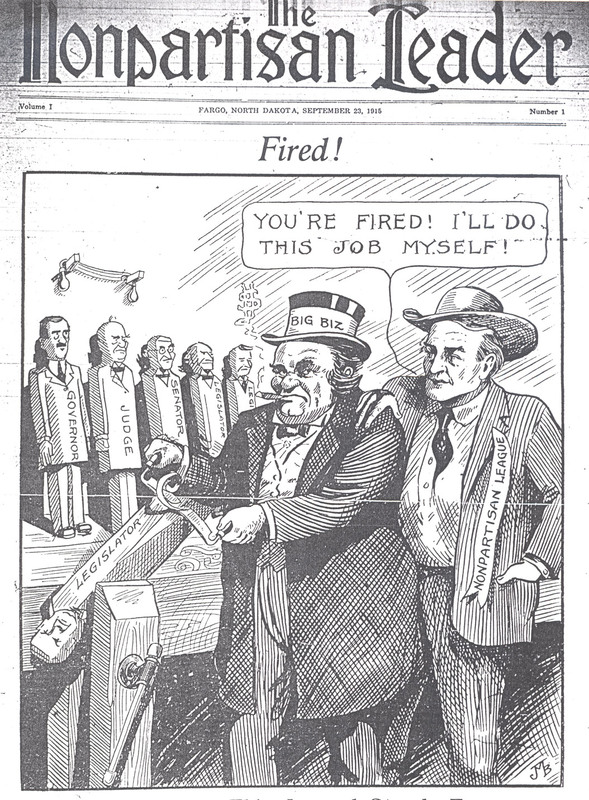 Knowing that they were the underdogs in this fight against the power brokers of the Gilded Age, the members of the Nonpartisan League called themselves the “six buck suckers.” Their slogan was, “We’re too dumb to quit.” The NPL published regular newspaper and used poignant political cartoons to educate North Dakotans. They knew they were in a David and Goliath match. Farm families were losing their land, their homes, and their livelihoods. What more did they have to lose? One weapon that the Nonpartisan League had on their side was the right to vote, which North Dakota extended to women before the rest of the country did. The League sponsored meetings, not just for the farmers but also for the farm wives. Farm wives led lives of drudgery and isolation. Ladies luncheons—with political discussion—were a welcome change from everyday farm life for these women. Regardless of party, the NPL backed candidates who pledged to work toward these common goals. Their pitch—particularly to the farm wives—was “vote for the family, not for the party.” The NPL encouraged people to vote for politicians who shared their values and who would work for the people, instead of working for corporations. In 1916, the NPL ran a slate of candidates as Republicans. (This is when progressive reformers like Teddy Roosevelt were Republicans.) The NPL took the governorship and seats in the Legislature. 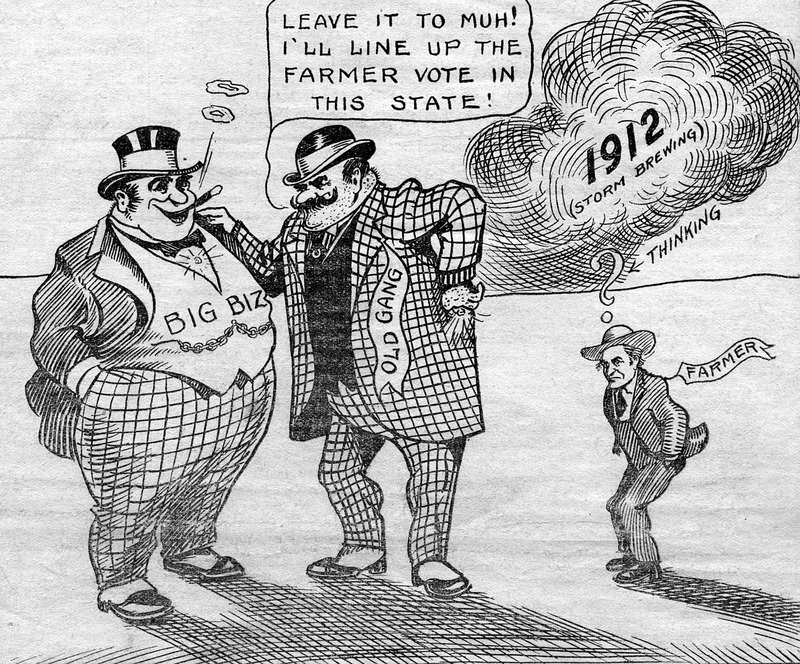 After the 1918 election, the Nonpartisan League controlled the entire Legislature, one Congressional seat, and the Governorship. With organization, true grit, and the right to vote, the Nonpartisan League staged a revolution in North Dakota. As a result, the NPL-led Legislature passed multiple progressive reforms to help the people of North Dakota. Most notably, these progressives created the Bank of North Dakota, which got North Dakota out from under Wall Street’s thumb and built a robust economy that is a model today. Is It Time to Bring Back the NPL? Cartoon from the Nonpartisan Leader. Since the Wall Street crash of 2008-09, millions of Americans have lost their jobs and their homes. Many who have found work again are working multiple low-paying jobs with no benefits. By manipulating Congress and state legislatures, corporate America and wealthy dark money donors have stacked the deck against us. Thanks to the Supreme Court’s Citizens United decision, corporations are people and money is speech. As a result, elections at all levels are awash with dark money trying to manipulate government. In states like Arizona, this scenario translates into millions of dollars stolen from k-12 education and the university system and transferred to big corporations in the form of tax cuts. Sweetheart deals for pet industries like for-profit schools and prisons trump investment in infrastructure and education. Citizens and small local businesses alike are strapped for cash or saddled with too much debt. There have been studies that show small businesses often turn to credit cards for expansion. If you withdraw $10,000 from your credit card to expand your business and miss a credit card payment, the interest rate jumps to 30%. That’s not sustainable and often leads to bankruptcy. Workers, students and small local businesses are all starved for cash due to stagnant low wages and mounting debt. It’s depressing. It’s austerity. It’s government against the people. This cycle of austerity for the 99% and largesse for the 1% is unsustainable. Thanks to decades of trickledown economics, the income gap between the wealthiest Americans and the rest of us has never been greater. How can we fix this? I find hope and inspiration in the story of the Nonpartisan League and in the promise of public banking to rebuild our economy, make it more just, and to save the middle class. What is public banking? Public banking is “banking in the public interest.” Wall Street banks make deals for the good of their wealthy shareholders. Public banks make deals for the good of their shareholder—us, the citizens. Public banking is using all or part of the state’s rainy day funds to partner with community banks to invest in the future by investing in education, infrastructure, entrepreneurship and small business development, and debt relief. How do we do this? In a nutshell, the state bank self-funds interest-free infrastructure projects and (through community banks) offers affordable credit to local businesses, entrepreneurs, and college students. Currently every city, county, and state in the US (except for North Dakota) holds its rainy day funds in a too-big-to-fail bank, and those funds are invested on Wall Street for the good of the bank’s shareholders—not for the good of the taxpayers. If a state or local government wants to build a road or fix the potholes, they borrow the money from Wall Street and pay interest and fees on that loan. Yes, we pay fees to Wall Street to hold our money, and we pay interest and fees when we want to use our money. Local and state governments are paying billions of dollars in financial fees each year. THIS IS A WASTE OF TAXPAYER FUNDS. If the state took all or part of its rainy day funds and established a public bank, it could self-fund highways, bridges, education, economic development—without going into debt to Wall Street. If the state had a public bank, it could also help local governments by lending them money for improvements at a reasonable rate. The local governments would save money, the state would make a modest income on these loans, and all levels of government would be free of Wall Street debt. This is a sustainable economic loop. Giving away tax incentives is not sustainable. Giving affordable credit is sustainable. The City of Santa Fe recently did a public banking feasibility study. They found that they could buy back their bond debt and they could save $25 million over 10 years. Arizonans for a New Economy co-directors Jim Hannley and Pamela Powers Hannley met with Tech Park VP Bruce Wright to discuss using public banking to grow Tucson’s tech industry. When I say that public banking can help build local businesses and help entrepreneurs, I’m not talking about economic development “incentives” or tax-deferred districts. I’m talking about affordable credit. The state of North Dakota offers North Dakota entrepreneurs $250,000 start-up loans that are interest free for the first two years. Thanks primarily to research at the University of Arizona, Tucson has one the highest per capita rates of patents in the US. Offering entrepreneurs start-up funds is the no-brainer route to economic diversification. With its rich tradition of science, art, music and great food, Tucson could be the Athens of the West—instead of the Dusty Pueblo—if we invested in our strengths instead of chasing rainbows and call centers. And Tucson is not unique in this. Far too many cities compete against each other in a race to the bottom to lure corporations and sports teams—rather than investing in their local businesses. 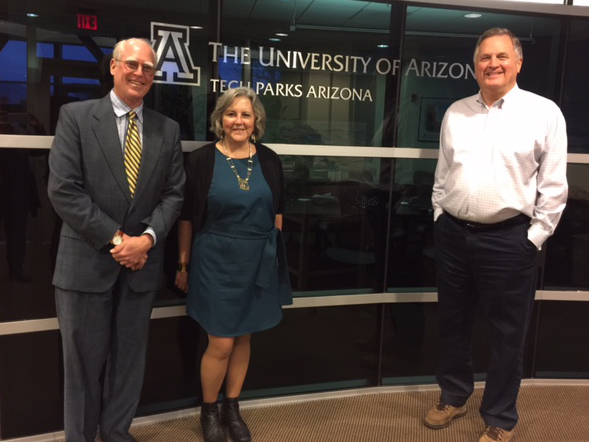 In December 2015, my husband Jim and I met with the University of Arizona Tech Park vice president to discuss using public banking to grow Tech Park-incubated small businesses. VP Bruce Wright told us that Tucson lost two start-up companies in 2015 because they couldn’t get sufficient start-up capital. All of the City of Tucson’s funds are held by Wells Fargo. All of the University of Arizona’s funds are held by Wells Fargo. All of the Tech Park’s funds are held by Wells Fargo. When the Vice President of the Tech Park went to Wells Fargo and asked for help with start-up funds for entrepreneurs. They said, “No, we don’t do that.” Why not? The community Wells Fargo serves needs economic diversification, but lending to local small business is not what Wall Street does. In addition to the tech industry, Tucson has a budding fashion and design industry and a burgeoning reputation as a food destination. Instead of spending millions of dollars in taxpayer funds to build roads and buildings for multinational corporations, a Tucson or Southern Arizona public bank could work with local community banks to invest in these local entrepreneurs by offering low-cost loans, with two years interest-free. Helping local small businesses and entrepreneurs thrive will diversify our local economy, improve our job market, and strengthen local banks. Why aren’t we doing this? Public banking and debt-free infrastructure projects are not a new idea. Forty percent of the world’s banks are public banks, but there’s only one in the US—the Bank of North Dakota. For more than 100 years, the Bank of North Dakota has been a key partner in building that state’s economy and keeping it stable. When Wall Street crashed the world economy and all of the state budgets, the only state that didn’t crash was North Dakota because their money was invested on Main Street, not on Wall Street. The Bank of North Dakota invests its money in infrastructure projects, entrepreneurs, family farms, and college students. That’s what investing in the future looks like. Arizona’s total debt service rose 94% between 2007-2014. One of the big benefits of the Bank of North Dakota is that state is not in debt to Wall Street. The cost of governmental indebtedness is staggering. The Public Banking Institute recently started a project called “What Wall Street Costs America” in order to shed light on this enormous waste of taxpayer funds. For example, the state of Arizona pays $312 million a year in interest on its debt. The City of Tucson pays $25 million, and Pima County $26 million. 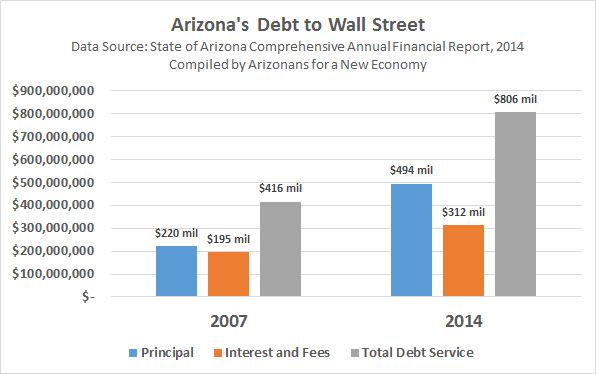 Add in all of the debt owed by the other cities and counties in Arizona, and the state’s cumulative interest payment to Wall Street banks easily tops $1 billion per year. No wonder we can’t fix our streets or fully fund public education. States and local governments are throwing taxpayer money away. A few weeks ago when presidential candidate Bernie Sanders was asked by the New York Daily News how we would bust up the big banks—his signature issue—he didn’t have many details. When I heard this on the radio, I said, “Bernie! Public banking! Say it!” Busting up the banks is a great slogan, but getting legislation through Congress to do this would be a huge, lengthy battle. There are roughly 50 public banking advocacy groups in the US and around the world. If even half of these projects successfully established public banks and moved their money out of a Wall Street, the power and size of the too-big-to-fail banks would be greatly reduced. The Nonparitisan League sparked a revolution in North Dakota in 1919. It’s time that American voters took a cue from the Nonpartisan League and voted politicians who will work for the people—and not for big money donors. It’s time to band together to take back our money and invest it on Main Street for the public good. It’s time to break the chains of debt. It’s time to truly invest in ourselves. It’s time for a financial revolution. It’s time to vote for reform–not business as usual. If you want to help the public banking movement, go to PublicBankingInstitute.org, join the mailing list to learn about what’s going on, and find local efforts. Also, please consider making a donation to support public banking and the What Wall Street Costs America project. This is a transcript of a speech delivered to Unitarian Universalists in Santa Barbara by Pamela Powers Hannley, co-director of Arizonans for a New Economy, vice chair of the Public Banking Institute , and progressive Democratic candidate for the Arizona House, representing LD9.. Excellent article Pam! I forwarded to several folks. Neither taxes nor death are inevitable. Deal with it. See 2500 y ears of eye witness history by ben abba.